Thanks to Dr. Thiriveni Balajji, Coimbatore Medical College (India), for contributing this case and the discussion. To contribute a Case of the Week, follow the guidelines on our Case of the Week page. 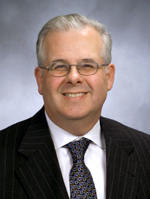 The Tutorial, sponsored by The Department of Pathology and Laboratory Medicine, Weill Cornell Medical College, will be held under the direction of Dr. Daniel M. Knowles, Professor and Chairman. The program will consist of lectures and case presentations. The Tutorial faculty will prepare an extensive USB flash drive comprised of lecture notes and reference citations covering all of the topics presented at the Tutorial. In addition we will provide a notebook comprised of all power point presentations. The registration fee is $1,350, after December 30, 2014 $1,450. (1) Our Feature page for November is Consumable Lab Products / Clinical Lab Analyzers, and highlights our advertisers Leica Biosystems and Ventana Medical. It also contains an original short article, "Laboratory Consumables: Pathology Glass Slides", by Jaleh Mansouri, M.D. (2) October traffic broke another record, with 661,468 total visits, 2,000,307 total page views and average daily visits of 21,337. Thanks for your support! (3) We have now posted the Pathologist Jobs Report for the third quarter of 2014. For this quarter, there were 86 job postings for full time or part time pathologists at PathologyOutlines.com. This is a 19% increase from the 72 postings in the third quarter of 2013. For the first 3 quarters of 2014, there were 230 postings, a 17% increase from the 196 postings for the first 3 quarters of 2013. (4) We have posted the ten most popular books sold through Amazon.com from January to September 2014 on our Top Books page. (5) Currently, most of our organ systems have a topic that deals with Grossing. Is there any interest in putting them all together into a Grossing chapter? Email Dr. Pernick with your opinion. A 32 year old man had multiple, yellowish, waxy papules on both sides of the neck, which were biopsied. He also had angioid streaks in the retina. The lesion consists of clumped, irregular and occasionally swollen fibers in the mid- and lower dermis. The abnormal fibers are bright pink with an altered architecture, as they have lost their normal interlacing pattern. They may be faintly basophilic due to the presence of calcium. 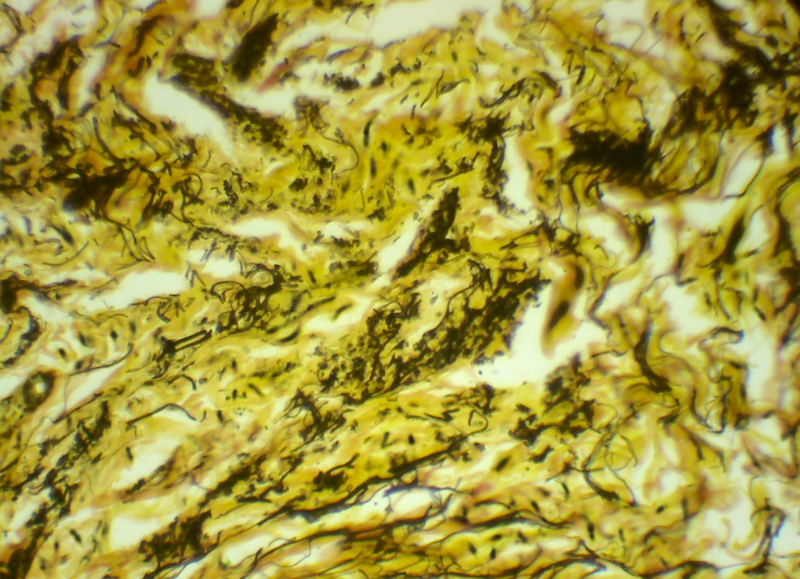 Verhoeff's Van Gieson stain for elastic fibers shows marked degeneration of fibers with a short and curled appearance. 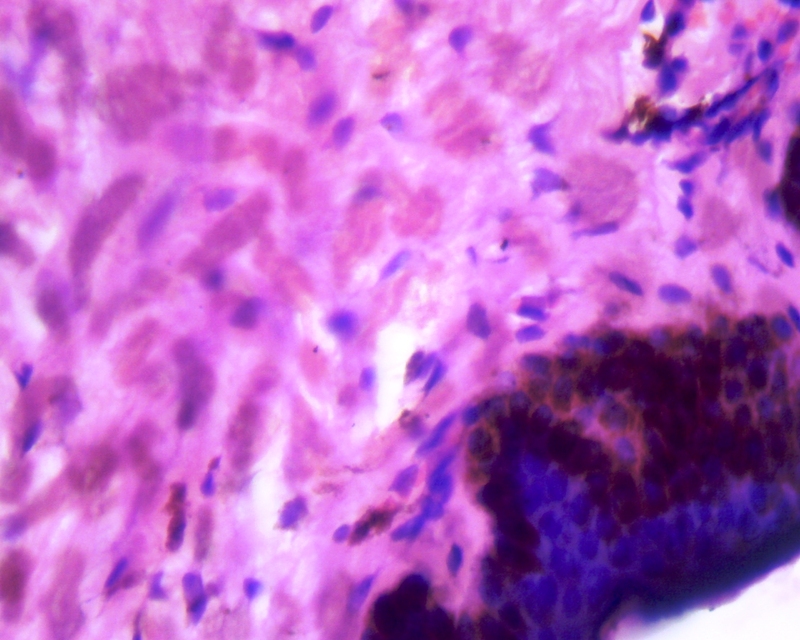 The Von Kossa stain (not shown) reveals calcium deposition. Pseudoxanthoma elasticum is an autosomal recessive, sometimes autosomal dominant, inherited disorder due to mutations of ABCC/MRP6 gene at 16p13.1, coding for an ATP-binding protein, and causing degeneration and calcification of elastic fibers (Nat Genet 2000;25:228). It also affects the retina and arterial walls of the gastric mucosa, coronary arteries and large peripheral arteries. 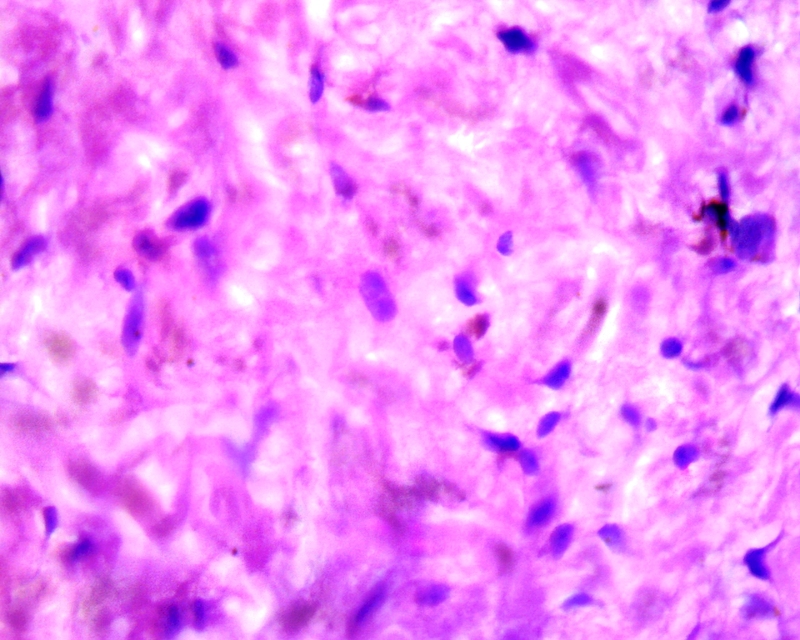 It appears to be related to generalized arterial calcification of infancy (Am J Hum Genet 2012;90:25). Patients typically present in the second and third decades with multiple soft, yellowish, coalescing papules in the sides of the neck, axillae or groin. The affected skin appears loose and wrinkled ("plucked chicken" appearance). Angioid streaks of the optic fundi may lead to progressive vision impairment. 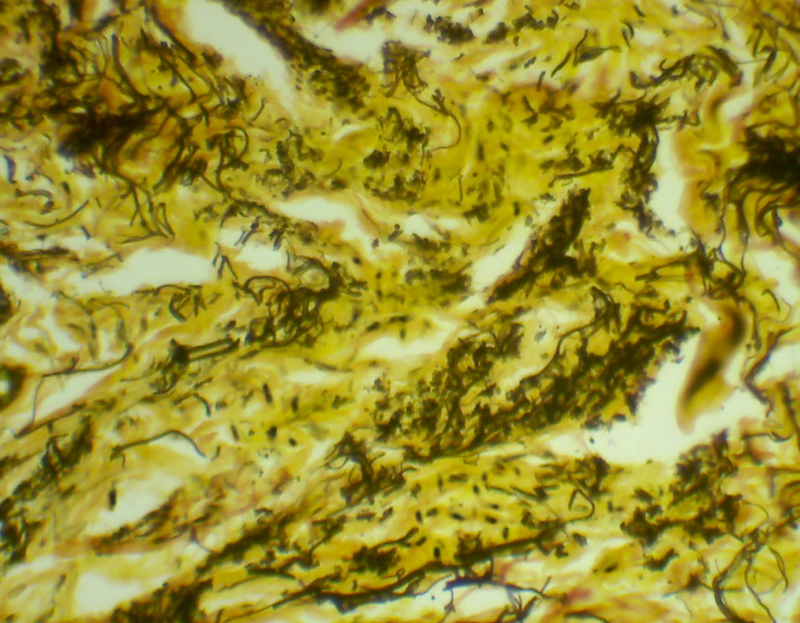 Involvement of the arterial elastic fibers may lead to gastric hemorrhage, angina pectoris and intermittent claudication (Arch Pathol Lab Med 1978;102:298). 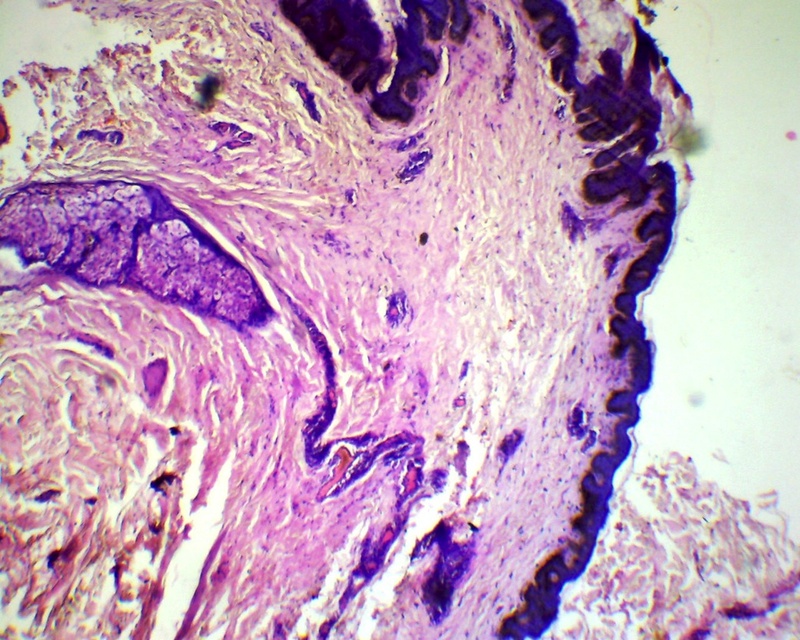 The differential diagnosis is broad, and includes cutis laxa, in which there is loss of the elastic tissue in the papillary and reticular dermis and the fibers are shortened, tapered and degenerate (Arch Dermatol 1965;92:373). 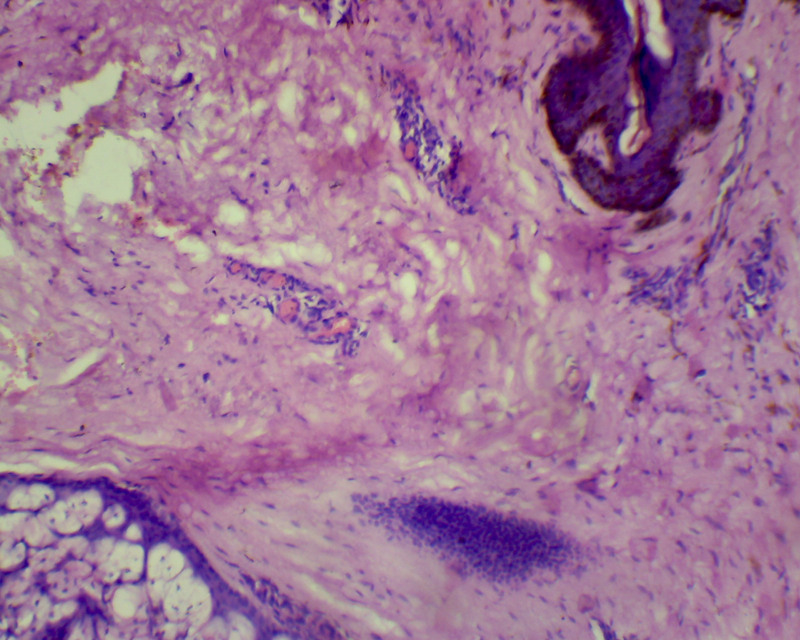 Pseudoxanthoma elasticum-like papillary dermal elastolysis may appear similar, but occurs in elderly females and systemic lesions are absent. 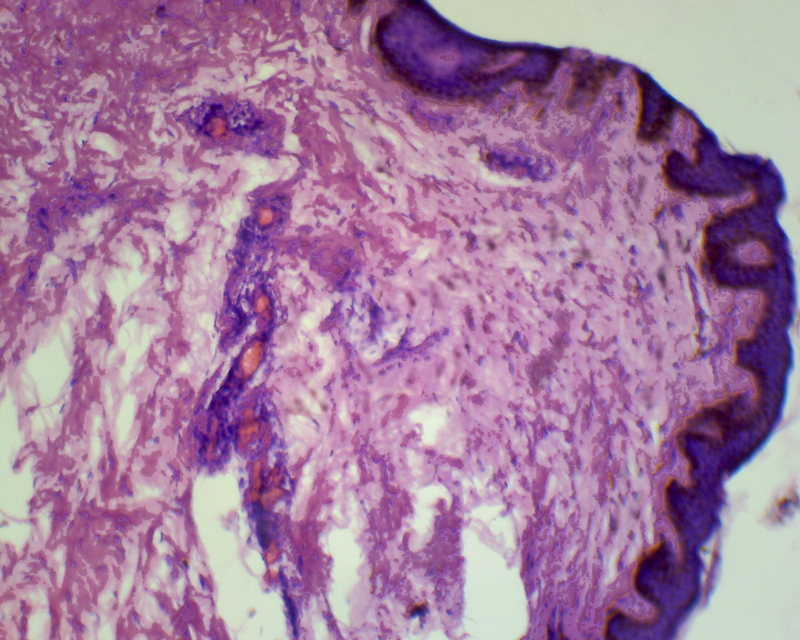 There is partial or complete elastolysis in the papillary dermis, but calcification is typically absent with normal collagen fibers (Br J Dermatol 1998;139:141). 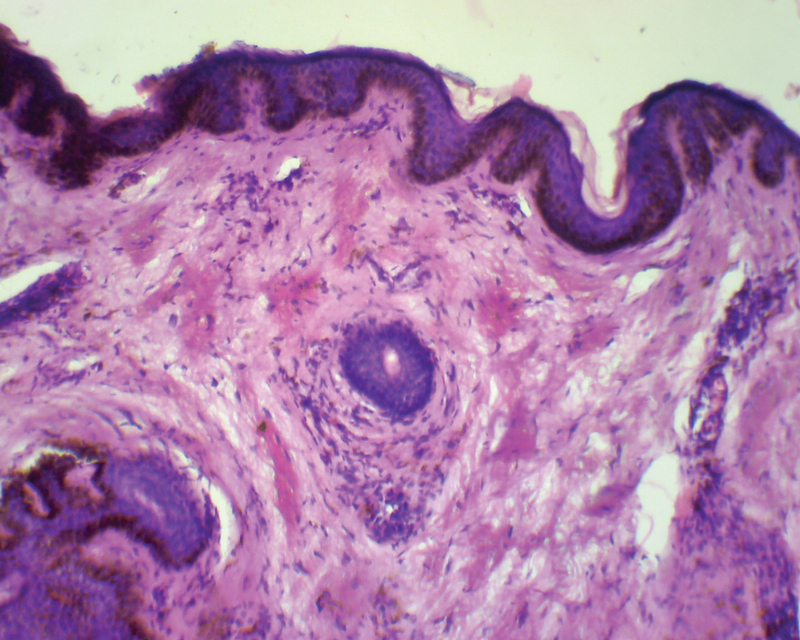 Late-onset focal dermal elastosis is characterized by normal elastic fibers in the mid- and deep dermis, with no evidence of calcification (Am J Dermatopathol 1999;21:381). Manifestations of pseudoxanthoma elasticum, including cutaneous lesions, angioid streaks and vascular calcification, have been identified in many hemolytic conditions including beta-thalassemia, sickle cell disease and hereditary spherocytosis (Br J Haematol 2003;122:852). There is no current treatment for this systemic disorder, but drugs which permit premature termination codon read-through in the ABCC6 gene are being investigated (J Invest Dermatol 2013;133:2672).